Disclosure: I received compensation as part of my affiliation with this Ambassadorship via Splash Media Engagement. The opinions on this blog are my own. It’s no secret that I love my coffee. In fact, the first thing I do when I wake up is brew myself a cup. My day can then begin. I cannot function without it. No joke. There’s nothing like the taste of a freshly brewed cup of coffee in the morning. I savour every drop. Then I usually make another and maybe another a few hours later. I wasn’t joking when I said I love my coffee! I’m always on the lookout for new brands of coffee to try. I recently was introduced to SingleJoCoffee.com and am anxiously awaiting the arrival of some K-cups to try! They have a wide selection of brews from roasters around the world.They offer single serve, K-Cup compatible coffee in an easy-flow filter design with eco-friendly packaging. They have even coined the phrase, “Less Waste, More Taste”. Sounds good to me. The early adopter in me loves the fact that I can try new brews with every order on SingleJoCoffee.com! For ever package of 12 that you buy, they’ll include a single serve coffee blend to sample. It’s a perfect way to discover new flavours without having to commit to ordering a full box. Then if you decide you enjoy it, you’ll know to include it in your next order. If you aren’t sure where to start, discover your Coffee Profile on SingleJoeCoffee.com. Answer a few short multiple choice questions and you’ll find out what type of coffee drinker you are and get recommendations for blends you’re likely to enjoy. I’m a Guru and they recommended some light roast blends for me. Is mom a coffee drinker? Right now you can save 15% when you buy 6 or more SingleJo products. Make sure to use the coupon code: MOMMAJO when you place your order. In my family, the apple doesn’t fall far from the tree. My mom is also a coffee drinker and I know she’d be excited to try some new blends. Go have a peek at the selection on SingleJoCoffee.com. Which ones do you think you would get? Connect with SingleJoCoffee.com on Facebook, Pinterest and Twitter. My hubby is the coffee drinker in our home! We don’t have a decent coffee maker, but hoping to eventually get him one that takes K-cups! This company sounds fantastic and always pro saving money!!! Oh gosh, we love coffee in our house! We would try each one. But, since it’s for MOM… being me… I would pick the Sunrise in Paradise. It sounds delicious! My Mom loves her coffee, five or six a day, sometimes more. I like that sample single serving that comes with a box of twelve. great for a new coffee taste. I love this. I don’t really know what I’d do without coffee. I want to try the Costa Rican coffee, looks good. Number one thing my mom has in the morning is coffee, she would probably try the costa rican coffee. Good slogan. My husband and stepdad are the coffee drinkers in my family, but I’m sure they wouldn’t mind if I used the code. Never heard of this company but nice touches with the profile and sample offer. Nice customer service. Wow, great deal! 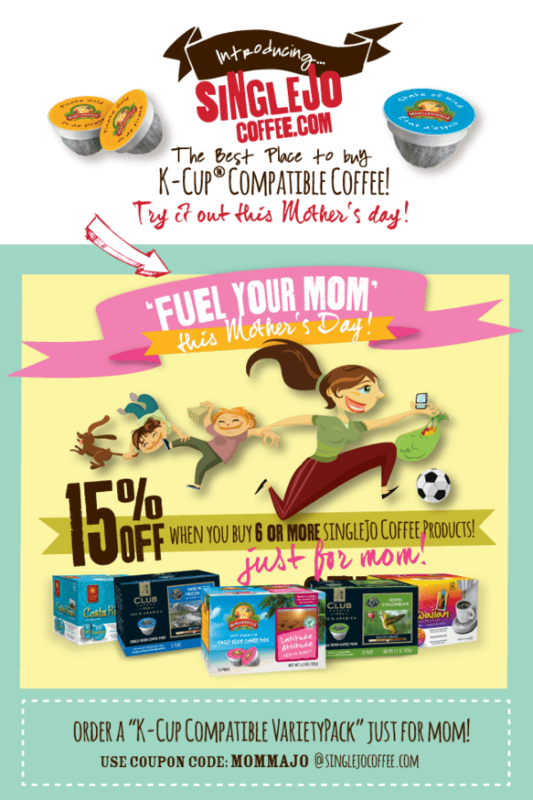 I gave my mom a k cup coffee brewer for her birthday so this would be a great mothers day gift!! I’m a coffee drinker through and through, morning, noon and night I’m hardly to be found without a cup in hand. I’d pick the Breakfast Supreme as I prefer a light roast to all others. What a much needed gif to a mom!